A durable three-layer shell jacket that is ready to accompany you to work, school or the outdoors, and back, all year round. The Men's Övik Eco-Shell Jacket is made from Eco-Shell that keeps you dry in persistent showers, and has excellent ventilation. At the same time, the material meets high sustainability demands and is quiet, lightweight and pliant. The design with many pockets gives it a distinct Fjällräven feel and it has extraordinary storage capacity. There are even two spacious pockets with flaps on the back and the top-loaded bellows pockets at the lower front have extra openings from the sides – easy to put hands in for quick extra warmth. In addition, there are two chest pockets with flaps and buttons, as well as two inside mesh pockets with zips. 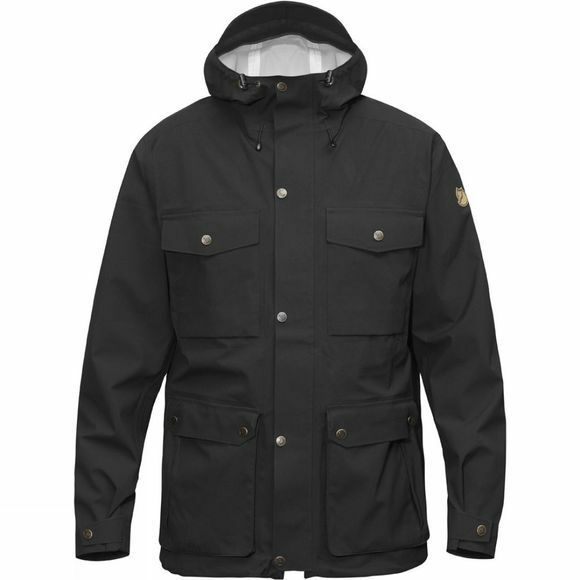 The Men's Övik Eco-Shell Jacket is hip-length and has a fixed, adjustable hood with laminated brim that keeps rain off the face. The zip at the front is two way so it can release excess warmth from both ends, and the protective flaps on both the inside and outside of the zip stop cold winds from getting inside.